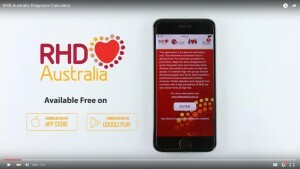 Key information from The Australian guideline for prevention, diagnosis and management of acute rheumatic fever and rheumatic heart disease (2nd edition) is available as a free app for iPhone, iPad and Android devices. The app includes the acute rheumatic fever diagnosis calculator. The calculator incorporates an information tab that provides a text and visual reference for each technical stage of a diagnosis. This is designed to minimise diagnosis error and inconsistency. There is no definitive diagnostic test for acute rheumatic fever. The only way to diagnose acute rheumatic fever is to put together a whole constellation of signs and symptoms to see if a patient has the disease. The diagnosis calculator helps clinicians with this complex diagnosis.